Leading Manufacturer of lead ingots and lead shot from Indore. Remelted Lead Ingots are being produced from Raw Lead/ Battery Scraps / Lead Scraps and other scraps of Lead. 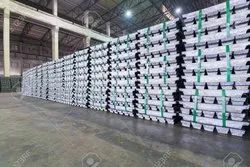 We produce Remelted Lead Ingots / Blocks, which contains about 97-99% Lead Metal with remaining Impurity Elements (Total 2-3%) as Antimony, Tin, Arsenic, Iron, Bismuth, Copper, Silver etc. This is commercially called as ‘Raw Lead or Lead Bullion‘, which is further processed to Pure Lead (99.97 purity) and / or Specific Lead Alloys. Remelted Lead Ingots is being produced by Smelting Operation done in Blast Furnace / Rotary Furnace. India considered as one of the biggest Importer of this product. Lead Shot is normally used for radiation protection to fill and melt into hollow spaces and gaps in Lead shields where other Lead products like Lead sheet or Lead bricks are not approachable. The material has a low melting point and can be processed easily and fast into a homogenous barrier layer. The standard program comprises of diameters.Further dimensions can be produced on request. Stress testing Providing variable weights in strength-of-materials stress-testing systems. Split Balls a larger type of lead balls where each pellet is cut partway through the diameter. The heads of some dead blow hammers are filled with balls to minimize rebound off the struck surface. Shot belts scuba diving, cycling and swimming. Model rocketry to add weight to the nose of the rocket, increasing the stability factor. Lead balls are used for a regenerator in Stirling engines and thermo acoustic crycoolers. Lead balls for wall construction suitable for radiation shielding applications. It is used to attenuate radiation, especially X-rays and gamma rays in Medical and nuclear industry. For free casting steel / free machinery steel. The Lead Shot are used in a various industrial circles. They are chiefly used in weight balancing in different industries. Another category of lead shots which are offered from our side is lead metal shot which is very smooth and is produced from the best raw lead accessible.